The SETI Institute's Allen Telescope Array in Hat Creek, California is now searching 20,000 red dwarf stars for signs of intelligent life. The billions of stars in the night sky can give rise to the question, are we alone in the universe? The Search for Extraterrestrial Intelligence (SETI) seeks to answer that question by hunting for signs of advanced civilizations in the cosmos. The term SETI can be applied in two ways. The first characterizes the quest itself, the search for other advanced lifeforms undertaken by people around the world. 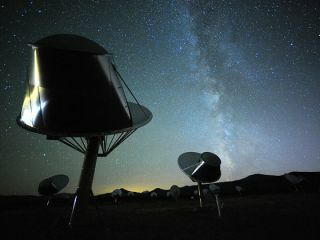 The SETI Institute, the second application, leads the charge in the pursuit of broadcasts from life beyond Earth. The largest player in the hunt for advanced life beyond the solar system, the SETI Institute is made up of scientists, engineers, technicians, teachers, and other support staff. In 1988, NASA began funding a strategy to sweep all directions of the sky in the hunt for life. Observations began in 1992, on the 500th anniversary of Christopher Columbus' arrival in the New World. However, within a year, Congress terminated funding. The SETI Institute then sought private funding to continue the hunt for advanced life in the universe. Donations from the enthusiastic public have helped continue the hunt for signals from other worlds. According to its website, the Institute has over 100 active projects, spanning astronomy and planetary sciences, chemical evolution, the origin of life and climate change. Project Phoenix continued the targeted search initially instituted by NASA. The program carefully examined regions around a thousand nearby sun-like stars with the world's largest antennae. In a joint project with the University of California, Berkeley, the Institute built 42 individual telescopes that function as a single massive instrument. The Allen Telescope Array, named for benefactor Paul Allen (co-founder of Microsoft), began observations in 2007. According to the SETI Institute, the array should allow scientists to examine as many as 1 million nearby stars in the next two decades. Extraterrestrial life can be roughly grouped into two categories. The first is the broad classification of life itself, a process that includes microbial and other simple forms. Without civilization and technology, life cannot produce the advanced signals that travel across the galaxy. However, many scientists continue to investigate atmospheres and other characteristics of worlds both in and out of the solar system as part of the search for life beyond our planet. The search for extraterrestrial intelligence looks beyond this broad category in an effort to find advanced civilizations. Most SETI searches focus on the hunt for radio or optical signals that can signify highly evolved alien life. Because life on Earth arose within 100 million years after the planet was habitable, many scientists think that life should evolve on planets with the right characteristics. With billions of stars in the galaxy, each thought to host at least one planet, there are numerous opportunities for life to evolve. The wealth of planets revealed by NASA's Kepler space telescope have produced a slew of potentially habitable worlds for SETI scientists to target. According to SETI Institute astronomer Seth Shostak, there are three ways to find life on other worlds. The first is to go and look, a process only feasible within the solar system. The second is by studying light from the planet to investigate its atmosphere, currently under way with instruments like NASA's Hubble Space Telescope. The third is to search for signals that could indicate intelligence. "That's what SETI does," Shostak said in a broadcast. Most SETI searches focus on radio signals, and most of these hunt for narrow-band signals, radio emissions that cover only a small portion of the radio spectrum. Natural objects blanket the spectrum with signals, so finding a signal that only dominated a small region would be suggestive of an artificial source. Scientists also focus on optical searches for advanced civilizations. These hunts involve looking for very brief flashes of light that last only nanoseconds. Messages from other worlds could be deliberately beamed or they could be accidental. Earth has been broadcasting signals since World War II, when radio communications became more common. SETI searches also look for intentional messages transmitted into space. More recently, the SETI hunt has begun to look for communications between two worlds along Earth's line of sight; messages beamed toward a planet or moon in the system could continue on toward Earth. Whether or not humans would be capable of understanding the message is another story. If a civilization is deliberately beaming a message into space, they may seek to distill it to its simplest form. However, if the message is accidentally broadcast or is a message for another world, it is possible that scientists will never be able to decode it. According to the SETI Institute, the signal will reveal a few things about the civilization producing it. Scientists will be able to pinpoint its origination, and changes can help determine how the planet is rotating and moving. "But even though this information is limited, the detection of an alien intelligence will be an enormously big story," the SETI Institute said on its website. "We'll be aware that we're neither alone nor the smartest thing in the universe." Having found the signal, the institute envisions that enthusiasm on Earth will spur humans to build larger dishes more capable of receiving weak signals. It is unlikely that Earth and an advanced civilization far from the sun will engage in much communication. That's because it can take years for a signal to travel from one planet to the other. The closest star, Alpha Centauri, is only 4.3 light-years away. If an advanced civilization exists on a (yet-unseen) planet around the star, it would take over eight years for a signal to travel from Earth to that world and back. In addition to accidental broadcasts, Earth has sent a handful of messages into space. In 1974, a simple message was transmitted from Arecibo Observatory in Puerto Rico. Both NASA and Russia have since sent a handful of brief, deliberate signals into space since then, according to the SETI Institute. When an interesting signal is detected, scientists must first verify it came from beyond Earth. By confirming observations with another radio telescope, they can make sure they have not picked up a human-created signal. Even if the original detector determines that the source didn’t come from Earth, additional instruments provide “duplication,” an important part of the scientific process. "Once an artificial signal is confirmed as being of extraterrestrial intelligent origin, the discovery will be announced as quickly and as widely as possible," said the SETI Institute. "There will be no secrecy, and indeed getting the word out quickly is important as there would be an urgent need to have astronomers world-wide monitor any detected signal 24 hour a day." While the SETI Institute is easily the most well-known seeker of signs of advanced civilizations, they are not the only ones. The University of California, Berkeley has several SETI programs under way, including one using the Arecibo Observatory. Italy's University of Bologna also has a radio SETI search in progress. Both Berkeley and Harvard University in Boston have optical SETI searches in progress. In a 2014 presentation to Congress, Shostak predicted that life would be found on worlds other than Earth in the near future. "It's unproven whether there is any life beyond Earth," Shostak said. "I think that situation is going to change within everyone's lifetime in this room." Even if no sign of an advanced civilization is found, the SETI Institute remains optimistic. According to their website, "We are just scratching the surface of what a modern search can do. Failure to find a signal wouldn’t prove that we’re the only thinking beings in the Galaxy. After all, absence of evidence is not evidence of absence." "The SETI Institute intends to press the search. Needless to say, the march of technology and new scientific discoveries will influence future SETI strategies. But giving up is not in the cards. Christopher Columbus did not turn around simply because he failed to find any new lands during his first few days at sea." Editor's note: This article was corrected to reflect the accurate distance to Alpha Centauri.